Amniotic fluid not only protects the fetus from injury and temperature changes, it also is circulated by the fetus every 3 hours. 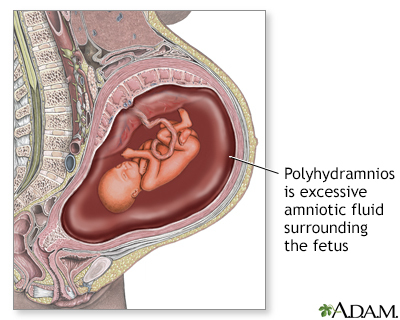 Polyhydramnios may occur when a fetus cannot swallow a normal amount of amniotic fluid due to a gastrointestinal, neurological, or other problem. 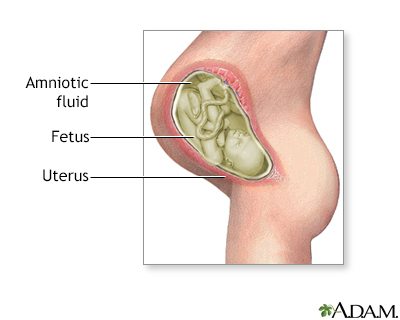 Amniotic fluid surrounds the growing fetus in the womb and protects the fetus from injury and temperature changes. It also allows for freedom of fetal movement and permits musculoskeletal development. The amniotic fluid can be withdrawn in a procedure called amniocentsis to check for chromosomal defects or other abnormalities.